The Wild Sheep Foundation (WSF) based in Bozeman, Montana, applauds the action taken Thursday by the Senate Energy and Natural Resources Committee on a bipartisan sportsmen’s bill that addresses many priorities for American hunters, anglers and recreational shooters. On a voice vote, the Senate E&NR advanced S.733, which would reauthorize key conservation programs, help boost the outdoor recreation economy, permanently establish the Wildlife and Hunting Heritage Conservation Council Advisory Committee and allow for expanded wildlife management measures on National Park Service lands. As the international leader in the conservation and restoration of wild sheep, WSF continues to work on public land access for sportsmen throughout the country. The Wild Sheep Foundation, formerly the Foundation for North American Wild Sheep, was founded in 1977 by wild sheep conservationists and enthusiasts. WSF’s Mission is to enhance wild sheep populations, promote professional wildlife management, and educate the public and youth on sustainable use and the conservation benefits of hunting while promoting the interests of the hunter and all stakeholders. With a membership of more than 7,000 worldwide and a Chapter and Affiliate network in North America and Europe, WSF is the premier advocate for wild sheep, other mountain wildlife, their habitats and their conservation. 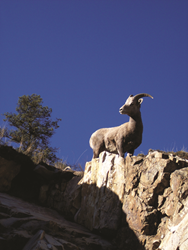 Since forming in 1977, the Wild Sheep Foundation and its chapters and affiliates have raised and expended more than $110 million on conservation, education and conservation advocacy programs in North America, Europe and Asia towards its purpose to “Put and Keep Wild Sheep On the Mountain”™. These and other efforts have resulted in a three-fold increase in bighorn sheep populations in North America from their historic 1950-60s lows of 25,000 to 85,000 today. WSF, its Chapters, Affiliates and agency partners are also working together to ensure thinhorn sheep thrive in their northern mountain realms for generations to enjoy.